When I heard that the Liverpool Everyman – a theatre close to my heart and home – was putting on a production of Othello in which the protagonist was not only played by a woman, but played as a woman, I was ecstatic. All too frequently, actresses are forced to play famous male roles as androgynous men. However, while Golda Rosheuvel gave a powerful, stunning performance as Othello, the production is overall somewhat disappointing. The concept of a female Othello could be pushed much further, turning the play into a feminist statement about the discrimination that specifically black queer women face in male dominated fields; unfortunately, it falls short of this impact. Beyond the lacklustre approach to the concept, the production also feels incoherent because of the seemingly unfinished alterations to the script. Othello’s pronouns have all been altered from “he” to “she”, and yet she is still referred to as Desdemona’s husband; lines such as “are you a man?” are also unchanged. The small cast fails to sufficiently command the in-the-round stage, a production choice which also limits the opportunity for set-dressing, although it does have the advantage of engaging the audience with the drama as it unfolds – when the cast is successful. Generally, there is a lack of atmosphere or ambience, though the final scene is an impressive exception. Rosheuvel’s performance is the saving grace of the production. Beginning as a noble, upright, and cold army general, this characterisation is in keeping with typical interpretations of the character, although with an added gendered element; it is implied that Othello has adopted such rigid mannerisms in order to survive in the male-dominated military. Initially, she is a difficult character to like, but her transformation in the second act is startling and extremely emotive. Patrick Brennan, too, gives a strong performance as gleeful Iago, deftly manipulating the other characters and enthralling the audience through his soliloquies. Unfortunately, Emily Hughes’s Desdemona is less convincing. She appears youthful – elfin, even – and her costumes are clever: she dresses in tight, brightly coloured clothing and beachwear, an heiress in the Paris Hilton mode. Yet her performance is wispy and lacklustre at times, and she and Rosheuvel fail to generate the required chemistry to make them a believable couple. In spite of its good qualities, including the outstanding final scene, this production is ultimately unsatisfying. Rosheuvel’s performance is the clear highlight, staying with me long after the end of the play, but there are many incoherent elements. Had it been pushed further, the core concept could open up many new ways of looking at this text; as it is, this interpretation will hopefully form an important building-block for future adaptations which take more risks with their approach to the gender and sexuality of Shakespeare’s characters. 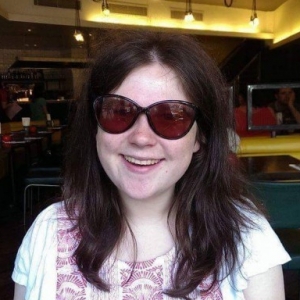 Megan is a second-year English Literature student at the University of Sheffield with a lifelong passion for theatre. She has participated in many theatrical productions, devised her own performances and has even written a research paper on the power of theatre to aid the social development of autistic children. She is particularly enamoured with the work of Shakespeare and how different productions take on the challenge of representing his plays, yet she enjoys all different types of theatre.